Energy-efficient production. Once inoculated, a log will continue producing for up to eight years. No need for weeding, pruning, fertilizing or other chores—only harvesting. Use of space. Pine groves, streamsides, swampy clumps of trees—shiitake can fill that agroforestry niche in those otherwise underutilized corners of the landscape. Use of timber. Tree disposal can be a costly liability. Shiitake can convert that into a productive asset. Food. Last but not least, mushrooms provide fiber, copper, zinc and especially protein, perfect for sustaining vegetarians and subterranean lizard-people alike. The location pictured here is The Anthill Farm in beautiful northeast Pennsylvania, zone 6, altitude 1,200 feet. Thanks to comrades Sky, Sam and Roy for the lesson. They had inoculated 125 logs the year before. During the inoculation pictured here (April 8th and 10th, 2015) we are doing 90 more. For Supplies we used the varieties Night Velvet, Bellwhether, and Double Jewel, purchased from Field and Forest Products. We went with the sawdust inoculate rather than the wooden plugs. It was around $90 for three bags (one of each variety), which was slightly more than enough for the 90 logs. Start cutting in late winter; fell trees, slice logs to length, and leave them laying. Then in spring, gather logs and begin. Or, if you've missed late winter, wait till fall. Cut logs then begin after two weeks (before logs dry out, lose bark, or become infested with competing fungi). Tree species best suited for shiitake are red and white oaks and sugar maples especially, as well as ironwood, sweetgum or other hardwoods. Avoid species that are soft like willow or poplar, alleliopathic like black walnut, rot-resistant like black locust, or acidic like conifers. Cut logs to 36-48” long ideally, short enough to handle but long enough to retain moisture. (Good to have in mind before dicing up trees). Log diameter between 3-8” is ideal. 1. Drill holes 6” apart in a straight line, in rows 2" apart, staggered (see crappy image). 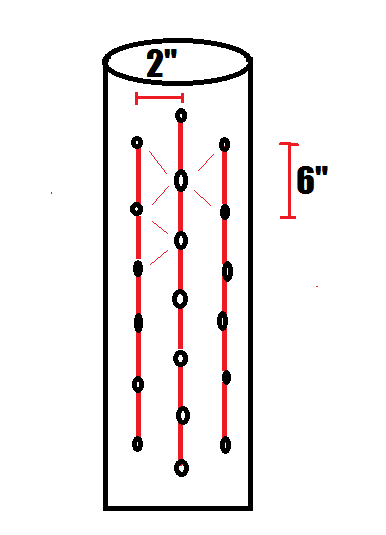 Holes should be 1” deep, with 5/16” or 7/16” drill bits (for plugs or sawdust, respectively). 2. Inoculate using a hammer for plugs, or palm injector for sawdust. 3. Seal by melting paraffin or 'cheese' wax in a pot, then dabbing over holes. To keep the inoculant from washing out, shoot for that complete Seal. Moisture is key, so stack them in a shaded, low area protected from sun and wind. Ideal summertime temperatures are 60-80F, with ~80% humidity. Don't allow logs to dry out. Roughly 1” per week needed, irrigate if no rainfall. Lay logs lower to ground to retain moisture (and in winter to protect from winds). Previous production site. At 7~8 years old it's past its prime and abandoned, but still bearing some fruit. Hugelkultur anyone? Natural Farming in the Andes. Or put spent logs under a pile of saw dust and make a shiitake mountain. Great idea. Sounds sort of like a Shiitake hugulkultur. Thanks for sharing! Climate is the main influencing factor IMHO. Most advice is based on continental climates. That said. IMO logs should be treated as a high value/greenhouse crop. And given extra care and attention. NB not left in the woods or somewhere out of the way. Also. They will benefit from additional heat. So my suggestion is to keep newly inoculated logs under the bench in a polytunnel for the first few months of their life. This will accelerate colonisation and reduce the risk of failure. Associated and brought on by extended colonisation periods. In this case. Moisture management would be indicated. Sprayers or immersion would both be possible. But basically you're looking for fast, at least partial colonisation, then they can go outside. To a place that is regularly visited or passed by. One place would work well, is in a chicken enclosure. There they can deal with slugs. Think tomato. But a proteinous one.